1 YEAR FREE TELUS INTERNET AND TV WITH A PVR!! THAT'S A $1300 SAVINGS!! Hollick Kenyons's modern open concept 2 bedroom/2 bathroom suites include in-suite laundry, fridge, stove, dishwasher and microwave. These beautiful rental apartments are transitioning to 100% smoke-free living and are the perfect place to call home. 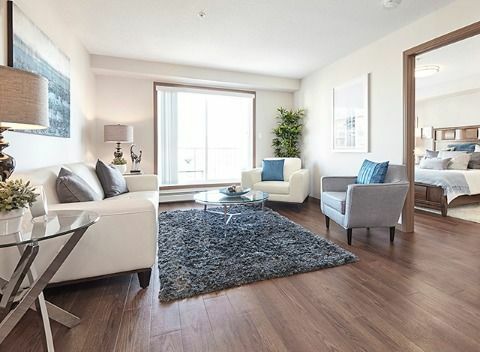 Great features are offered such as: 9' ceilings, blinds covering large windows, luxury vinyl plank flooring, private balconies for every suite, elevators and 24 hour on-site management, plus heat and water are included in the rent. Excellent retail amenities in the Hollick Kenyon Landing shopping complex across the street include a large Sobeys grocery store, plus easy access to Anthony Henday Drive. We are a 30 minute commute to downtown for those that work downtown but do not want to live there! We are taking applications - 1 year leases with a deposit equal to one months rent. 1 bedroom are 652 sq. ft., 2 bedroom/2 bathroom range in size from 893 -1004 sq. ft. Call today or stop in to view our show suite and make Hollick Kenyon Apartments your new home! 30 minute commute to downtown! There are several big box stores a few minutes away including Lowe's, HomeSense and Cineplex Cinemas.